My coffee cup completely missed my mouth this morning and I got coffee down my shirt. So, that’s how today is shaping up. On to these chickpeas. Because they are wonderful, and if it was possible to marry an inanimate object I would marry these chickpeas. If you’re looking at your screen with that Liz-be-tripping-again look on your face, I have only one word to say to you. Okay, I have several. Spicy. Smoky. Crunchy. Or, as I just improperly spelled that last one, CHRUNCHY. These chickpeas are perfect in every single way. They’re good as a snack. They’re good tossed in a salad. They’d probably be good in some fusion taco, but I didn’t try that and therefore cannot speak to its actual merits. But, THERE ARE SO MANY OPTIONS. I finished the batch and immediately wanted to make a new one. Try these, guys. You will not regret it! Pat your chickpeas dry. Mix the spices together and set aside. Mix together the chickpeas, oil, and 3/4 of the spice mix. Spread on a baking sheet and bake for 20 minutes, toss with a spatula or wooden spoon, and bake for another 15 minutes. Remove from the oven and add more of the spice mixture until you have your desired potency of spiciness. love roasted chickpeas and am excited to try your recipe. Sorry about the coffee accident. Hope your day has gone better since. Speaking of wanting to marry food, I had just made my first batch of soup with a recent SPLURGE (not splurge, this was a SPLURGE) on a VitaMix (!) purchase. And I’m just sitting here in shock. This soup redefines what it means to be soup. It’s velvety, silky, subtle, pungent, airy, savory. Oh my. Wish I could share with you. Do you want to come over next week for soup? I can clear my schedule 😉 Seriously, I had no idea DIY soup could be like this. Now if only I had a handful of your chickpeas to sprinkle over. (the soup is Carrot-Tofu-Ginger so would match your BBQ flavor well) We shall change the names of our blogs to Lizs Be Tripping Over Soup and Chickpeas and Other Things Edible. Yes? I’d be all for that blog. And, I AM SO JEALOUS YOU HAVE A VITAMIX!!!! I’ve been joking for years that I’m putting one on my wedding registry. I can’t bite the bullet and spend that money, though. I WANT to, but I can’t! I LOVE roasted chickpeas. We make a version with cajun seasoning, but I have a feeling these barbecue ones could be even more addictive…..On the plus side of the coffee incident, your week can only get better from here! 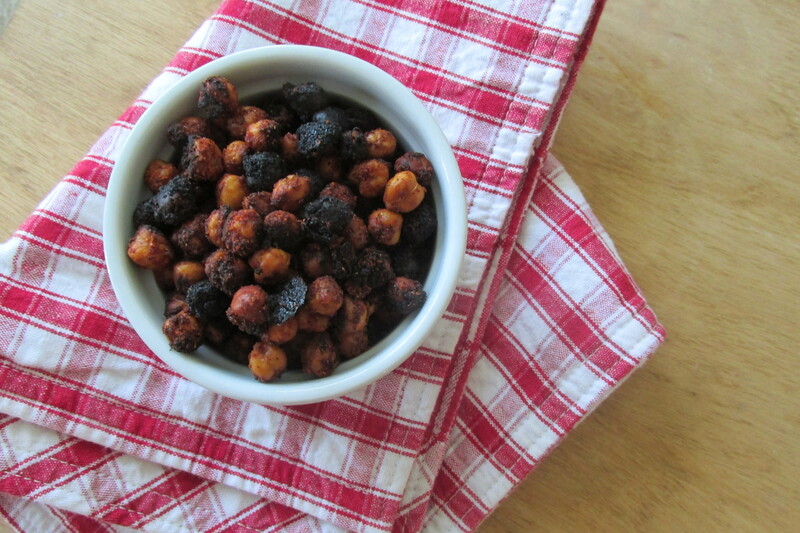 Roasted chickpeas are one of my absolute favorite snacks. That barbecue flavor sounds totally addictive! It really is! I couldn’t stop eating them! Sad day about the coffee! I’ve definitely been there before. I’ve never had roasted chickpeas, but I’d try them! I love these and then I also make ones with chili spices. Those are GREAT for tacos! Hahah how can you be missing your mouth? Lol so funny!! OK chickpeas… These are amazing! !